Artist, Frank Dale, honors Johannes Vermeer (1632-1675) in the Little Art Gallery’s upcoming exhibit. The Little Art Gallery of the North Canton Public Library will host artist, Frank Dale’s, exhibit “My Vermeers: A Tribute” beginning November 8, 2018. To honor his teacher, Dale has recreated Johannes Vermeer’s entire body of work to scale. The exhibit, which will not include any pieces available for purchase, will be displayed through December 9, 2018. An opening reception, hosted by the Friends of the Little Art Gallery, will be held Thursday, November 8, 2018 from 5:30 to 7:30 p.m. Hors d’oeuvres will be served. All are welcome. “As a young man with a passion to paint, I searched the history of painting looking for the painter who appealed to my particular view of things. When I discovered Vermeer, I stopped looking. Vermeer exhibited to me a reverence for womanhood that matched my own feelings. Also what appealed to me was the unequaled rendering of light and the intricate compositions – every little thing relates perfectly to every other little thing. The perspective drawing has been artfully arranged to maximize the effect of spatial relationships of the various elements in each composition. Many of these nuances were not fully appreciated by me until I started reproducing his work. One thing I had not anticipated was the scale of the paintings. Looking at the works in books they all seem about the same dimensions, but in reality the sizes range from 7 x 7 1⁄2 inches to 5 feet 3 inches x 4 feet 8 inches. The larger paintings evoke a whole different set of feelings in painting them and then just standing before them. It is as if you can walk into the scene,” explained Dale. Dale has been drawing pictures since before he was in elementary school. He completed his first oil painting at the age of eighteen. He studied art in Northern California where he grew up, attending The California School of Fine Arts in San Francisco and San Francisco State Teacher’s College in the late 1950’s and early 1960’s. During this period he lived and painted in the Haight-Ashbury area near Golden Gate Park, displaying and selling his works in local coffee houses and pizza shops. Dale took a break from art for several years to work in management and raise his family. During those years in management a need for someone who could draw often arose, and he found himself illustrating production manuals. 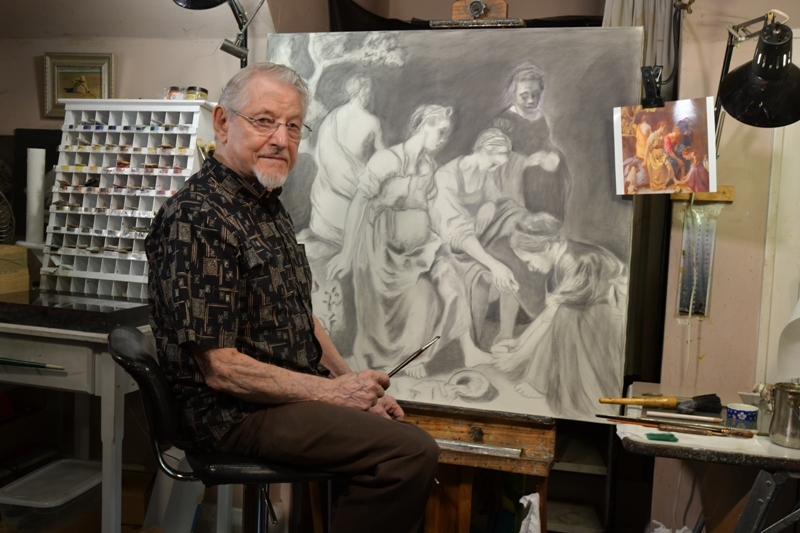 Since retiring from business in 1999, Dale has been able to devote all of his time to drawing, painting and researching the Flemish Technique. His oil paintings have won many awards ranging from Honorable Mention to Best of Show. Currently, Dale teaches classic oil painting in his home and at the Canton Museum of Art. He resides in Massillon.